This jQuery tutorial is available as a PDF. See this post for details and download link. Not too long ago I wrote an article for Six Revisions called Getting Started with jQuery that covered some important things (concept-wise) that beginning jQuery developers should know. This article is the complete opposite; there’s no concepts, no principles, and very little lecturing — just some straight example code with brief descriptions demonstrating what you can do with jQuery. This fast-paced tutorial should be able to get beginners up and running with jQuery very quickly, while also providing a good overview of what jQuery is capable of (although jQuery’s capabilities go far beyond this beginning tutorial). Keep in mind that this tutorial is just a bunch of straightforward, superficial code examples and very brief explanations for beginners who want to avoid all the jargon and complexities. But I still highly recommend that all beginners get past this stuff by means of a good book, some more in-depth tutorials online, or by using the jQuery documentation. The first thing you need to be up and running with jQuery is what’s called the “document ready” handler. Pretty much everything you code in jQuery will be contained inside one of these. This accomplishes two things: First, it ensures that the code does not run until the DOM is ready. This confirms that any elements being accessed are actually in existence, so the script won’t return any errors. Second, this ensures that your code is unobtrusive. That is, it’s separated from content (HTML) and presentation (CSS). Although you will normally include your jQuery code inside the above handler, for brevity the rest of the code examples in this tutorial will not include the “ready” handler. $("#myElement"); // selects one HTML element with ID "myElement"
$(".myClass"); // selects HTML elements with class "myClass"
$("p#myElement"); // selects paragraph elements with ID "myElement"
You could also check a set of elements (instead of just one), and the result would return “true” if any one of the elements contained the class. There are a number of ways to manipulate groups of elements with jQuery, including manipulating the content of those elements (whether text, inline elements, etc). jQuery also offers use of the commands appendTo(), prepend(), prependTo(), before(), insertBefore(), after(), insertAfter(), which work similarly to append but with their own unique characteristics that go beyond the scope of this simple tutorial. blur, focus, hover, keydown, load, mousemove, resize, scroll, submit, select. Remember that the “toggle” command will change whatever state the element currently has, and the parameters are both optional. The first parameter indicates the speed of the showing/hiding. If no speed is set, it will occur instantly, with no animation. A number for “speed” represents the speed in milliseconds. The second parameter is an optional function that will run when the command is finished executing. The second parameter (0.4) represents “opacity”, and is similar to the way opacity is set in CSS. Whatever the opacity is to start with, it will animate (fadeTo) until it reaches the setting specified, at the speed set (2000 milliseconds). The optional function (called a “callback function”) will run when the opacity change is complete. This is the way virtually all callback functions in jQuery work. Animation with jQuery is very powerful, and it does have its quirks (for example, to animate colors, you need a special plugin). It’s worth taking the time to learn to use the animate command in depth, but it is quite easy to use even for beginners. And please note that I’ve introduced a lot of commands and syntaxes in a very superficial manner, without explaining many of the problems you could have with some of these, so if you do run into problems, you can check out the jQuery documentation. Nice post, very useful with the basics of jQuery. Very clearly written, with great examples, well done! Finally something for beginners who actually want to get into coding, not just learning what the terms are called. As a beginner to Jquery I think this post is by far the best I have seen in terms of providing a beginner with straight forward to the point code. A much easier way to learn a language. You should post more in this style. In my view its the Best tutorial I have ever read about JQuery. well written post. really good stuff for starters. Great article, thanks a lot ! Thanks for sharing the great tips, i was about to start learning JQuery. I think this will help me a lot. thanks, I’m actually just getting started with jquery and this was probably one of the best posts on beginners jquery. and to your credit, I almost never comment on things. Really nice. Saved it as a pdf as well. That’s actually a really good idea, Kelly. I think I’ll provide this in PDF format as well in the future. Thanks! Much appreciate for this tutorial. very helpful! what a wonderful article. its really nice. if you really want to link the jquery script from their servers, and take advantage of the possibility of caching on the user’s end; you should be using “http://ajax.googleapis.com/ajax/libs/jquery/1.4.0/jquery.min.js” as the script source, and not “http://ajax.googleapis.com/ajax/libs/jquery/1.4.0/jquery.min.js?ver=1.4.0”. Because most browsers will not cache files which has a query string attached. I don’t think that’s 100% accurate. As long as the query string value remains exactly the same on subsequent reqests, then it will cache. I think you’re thinking of query string values that are dynamic, for example when you append a time stamp. In that case, the file will not cache because all subsequent requests will have a different time stamp. Caching is good if it can be controlled. Session id might be better, because u dont want to go and download for every request on the page..
Any thoughts on the short comings of this approach? IT realy very great. Thanks a lot. 60k (uncompressed) is huge and bloated? Hope your 14.4 steam-powered modem doesn’t burst. Better yoke up another team of cyber-donkeys to pull that massive load. Good catch. I’ve corrected it and fixed the PDF version, too. Thank you for such a nice and clean explanation. OOPS! your site is Down (for Sale)? it will be helpful for the beginner like me. Great post, the section on css selectors was especially helpful. I hope to incorporate some of this in my site! I’ve not even finished reading the whole post yet and I already know this is just what I’ve been looking for; JQuery for beginners-who-know-their-way-around-a-bit-of-code. Loving it! I’ve recently started commenting on SR too, so I hope I’ll catch some more of your posts up there! I have just started learning jQuery and now have something to practice with. Good Tutorial, easy to understand, I have translated it to chinese on my blog. This is a great tutorial! Thanks for sharing. well of course u r right. its very good for beginers…. Thanks for making this so easy to understand! I am a beginner when it comes to jQuery and this tutorial was very helpful! Thanks again. Man, This is the best tutorial i have ever seen on the internet on language introduction and code example. You rock my friend. It certainly clears up some cob-webs. Best tutorial I have ever seen !, thanks !!! Very very useful for me. Nice one to understand JQuery easily. Correct guidance for the beginners. Thanks. I have some issues with Jquery. Before loading the page, I would like to call server side based on the result which I got from server I want to lad that particular page. I am about to learn JQuery what are the necessary files to download to get started. Thank you very much! Really helpful post! Very clearly written, expalin with great examples. it will be helpfull to every body………………..
Nice Post, Keep it up…..
nice And good starter tutorial. Thank you! Well written beginner’s tutorial with good example. This is very good for beginner. Nice post. It’s very helpful to Jquery beginner. Where does this go in the HTML? This helps me a lot in learning jQuery. Thanks. fantastic tutorial. Very plain and simple yet very descriptive. I loved your flow of writing. good for beginners to understand each concept nicely. I write articles on JQuery as well in my personal blog. I would love to share your blog as a reference to my readers. You blog is awesome! It’a more than 3.5 years since you wrote the article, and it’s just as helpful now as when you wrote it! As a rank beginner to jQuery your article makes getting my head around the subject matter extremely easy. Many thanks for your effort. I’m looking forward to reading anything else you’ve written too. why the jquery distroys/stops sliding image of my blogger ? my blog url is :http://horizonkshitij.blogspot.com/ .please help me! Is these jquery easy to implement in the wordpress sites ? can you give some suggestions? This is really a good tutorial on jquery. The tutorial is quite simple, to the point and gives a starting platform for the beginners. thanks .. this is wonderful and instant tutorial! I’ve created a text changer effect using jQuery. Anybody, would you tell me if it can be made dynamic too? And can this be done with pure CSS “only”? Great stuff, i would appreciate your efforts. Very Good Stuff in very brief way of inputs. This is a very useful tutorial for learning jQuery quickly. Thanks! Very good tutorial, from beginner’s perspective :). 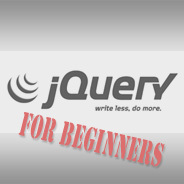 And yes best tutorial for beginners in Jquery so far. Thanks! This is amazing tutorial thank you for helping me, in the Class it takes 5 days to know them that the instructor teaches us, but within 20-30 minutes I got all the Idea of declaration ,how we selecting elements etc in j query. Very nice and simple for anyone to understand.